"Far Out! We have no real food in this house" - Teenager. Insert about a hundred more variations upon those themes and you have the anthem that is typically chorused by my three kids every single afternoon when they arrive home from school. If I knew just how much kids could eat before I had them, I would have invested in some kind of food business. You know like our own supermarket or a fleet of home chefs that cater to creating healthy but filling after school snacks. Hindsight huh. Useless bloody thing! 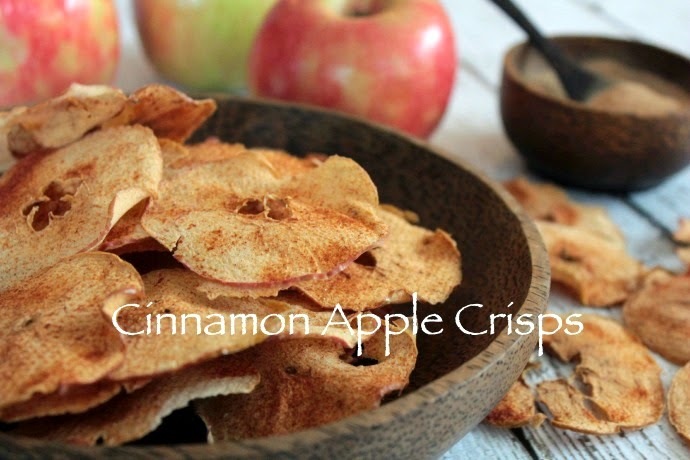 For those of us who don't have our own supermarkets to raid whenever we please or access to a home chef (i.e most of us), here's a recipe for homemade apple & cinnamon chips. They are an after school snack that is easy for even the most domestically challenged among us to master and yum enough that the kids will stop moaning about the lack of food for the whole 5 minutes it takes them to devour the lot. *Hint* make a lot of these as they tend to not last long in the hands of hungry midgets. Perfect for lunch boxes or after school snacks and the smell of the apple and cinnamon baking has the added bonus of making your home smell divine. 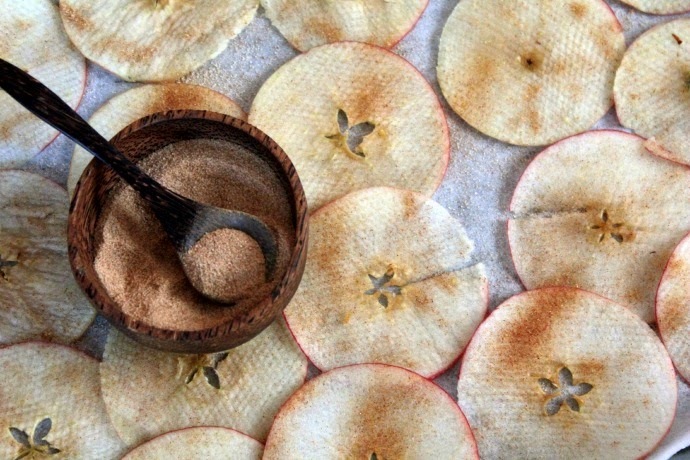 There is no need to core the apple for this recipe. 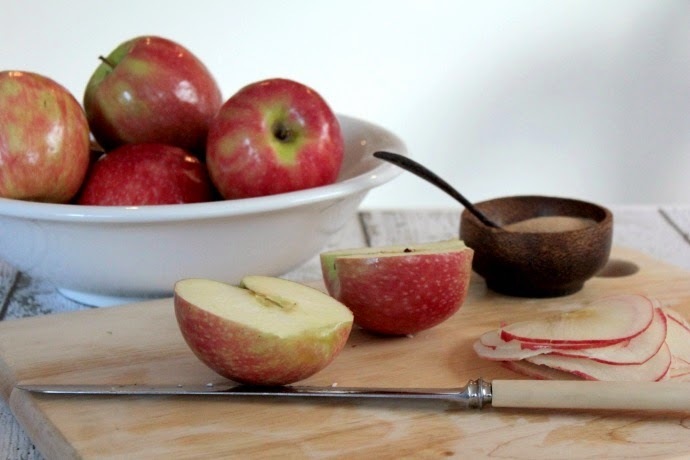 All you need to do is thinly slice your apple if full rounds. 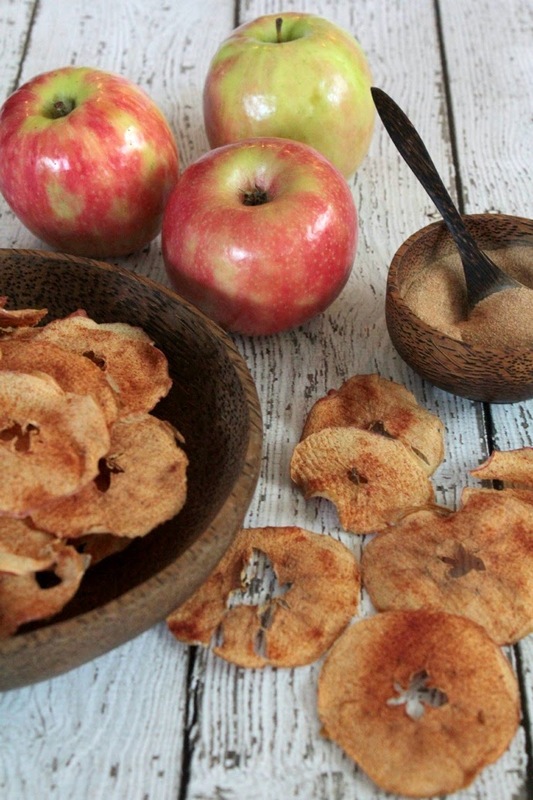 I find that using a mandolin gives you thin even slices that result in super crispy apple crisps. Lay your apple slices on a baking tray lined with baking paper. Try not to over lap your slices if possible. Sprinkle the cinnamon sugar generously over the slices and slow bake for 2 hours turning your slices once at the one hour mark. Let the cool for the ultimate crispiness and store in an air tight container. What's your fave after school snack to make for the kids? Were you also shocked by just how much those midgets consume? This recipe first appeared as my entry in the Salt & Pepper Blogger Bake Off. You can download the recipe card here.